The SEARCH function is categorized under TEXT functionsFunctionsList of the most important Excel functions for financial analysts. This cheat sheet covers 100s of functions that are critical to know as an Excel analyst. SEARCH will return the position of a specified character or sub-string within a supplied text string. Search_text (required argument) – It is the character or sub-string we wish to search. Start_num (optional argument) – It specifies the position the within_text string, from which the search should begin. If we omit the argument, it will take on the default value of 1, that is, it will begin the search at the start of the within_text string. 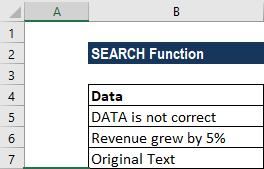 How to use the SEARCH Function in Excel? a. The given search_text is not found in the supplied within_text string. b. The given [start_num] is less than zero or is greater than the length of the supplied within_text string. a. ? – Matches any single character. 3. The FIND function doesn’t support case-sensitivity or use of wildcards so we can use the SEARCH function to search without case-sensitivity and/or to use wildcards.